Calls to action for pressing legislation or elections. Nov. 7 2017 is all about our Judiciary! Nov. 7 is Election Day this year and many of the candidates are running for judicial office or retention to judicial office. These races are extremely important to Democrats all across Pennsylvania, but why are they important? 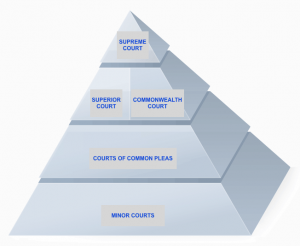 Check out the information at the bottom of our Voting Resources page to learn about the different courts in our judicial system, what types of cases they hear and how they connect. Then flip over to our Current Elections page to see who our Democratic Candidates are for Tuesday, Nov. 7! Make a plan to get to the polls on May 16! The 14WIDC mailed our yellow 2017 Voters Guide with a list of the Club’s endorsed candidates to the homes of all registered Democrats in the 14th Ward on Monday, May 8. Please check your mailbox for the flyer, or print the Voters Guide here to take with you to the polls. 2017 is an important election year with many judicial races, along with local elections for mayor, sheriff, city council and school board seats among others. Go vote and encourage your family, friends and neighbors to do the same.